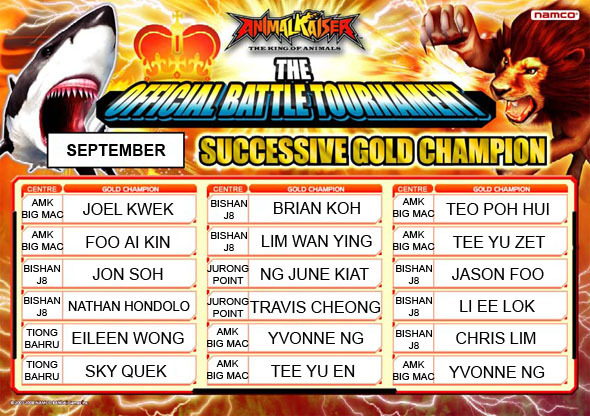 ANIMAL KAISER THE OFFICIAL BATTLE TOURNAMENT. It is a perfect FAMILY game for EVERYONE! No matter you are 6 years old or 60 years old, male or female, you can PLAY! So far, TKA VIRTUALAND & STAR FACTORY have held 68 tournaments in Singapore. The above charts show the 68 names of the successive GOLD CHAMPIONS! Could your name be next on the chart? Look out and JOIN the next tournament that is going to be held. WHO IS THE KING OF THE ANIMALS? All prizes are sponsored by Namco Bandai Games Inc. I missed out the tournament on 2 May , is there anymore animal kaiser tournament coming up???? please update me thank.. There will be 2 rounds of Animal Kaiser 3 Tournament on 27/06/2010(Sunday) at Star Factory Sun Plaza. Kindly refer to the Homepage for more details. Hi just check if star factory or virtual land got weekly animal kaiser competition? pls advise.. There will be 2 rounds of Animal Kaiser 3 Tournament on 02/05/2010(Sunday) at Bishan Junction 8 Virtualand.